Let me have a look at the calendar first. Yes, I knew it! This is the year 2007 and not sometime in the nineteen eighties. 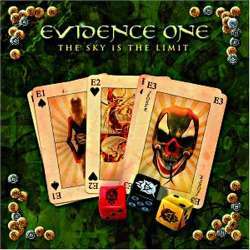 Evidence One are a German AOR / melodic hard rock band that are at least twenty years late with their third album The Sky Is The Limit. Not only the album title is a cliché but the songwriting continues consequently that direction. Stadium rock guitars, high vocals that want to sound like Survivor’s Eye Of The Tiger (the only ever good AOR song, and that only because my late grandmother was scared of the band when she saw the video clip, which was really cool, because normally nothing scared her so easily), festive choruses, a vast, all encompassing production. So ok, for AOR fans, this is probably heaven, but I can’t really get past this kind of music. Founded by members of Frontline and the vocalist from Domain, the various band members have gathered already a lot of experience in the past, and it’s obvious that there are enough people out there who enjoy this cheesy kind of rock music that smells like hairspray and looks like combined mullet-and-moustache outfits. At least the torture is not too long, and as much as I admit that for this genre of music, this is well done, it is still a release that is only preaching to the converted. All of you who think that bands like Gotthard, Krokus, Victory,… are really great will of course adore Evidence One, but I have sworn never to listen to this album again. Five points, for objectivity’s sake, although privately, I’d give even four less.